Truth be told, I started writing this in September 2010, while sitting in our friend Lori's beautiful house overlooking Little Sebago Lake in Gray, Maine, during my "gearing up for brain surgery" phase. 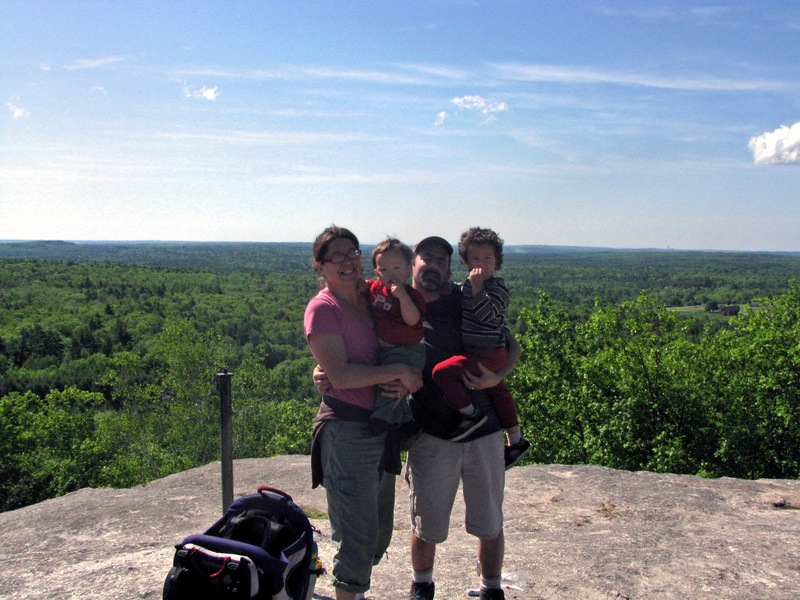 I think we had plans at that point to go hiking as a family, which was our annual tradition. 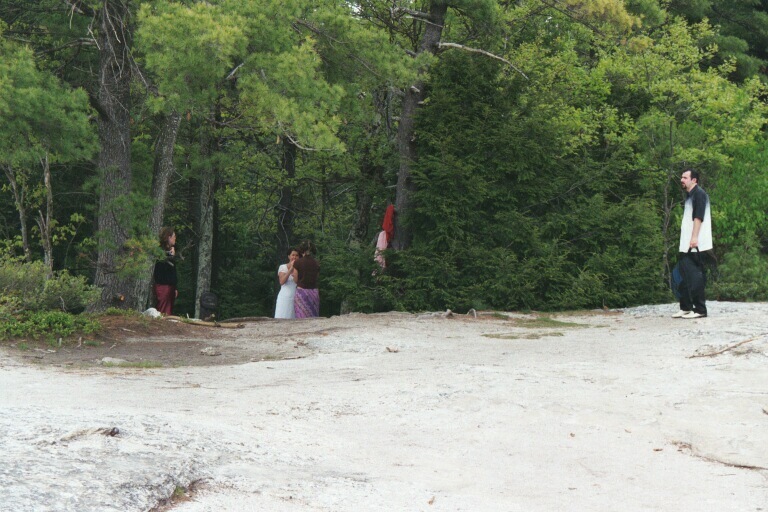 You see, Jamie and I were married atop Bradbury Mountain on May 24, 2002. I use those terms loosely, by the way. Bradbury is barely a mountain and we were barely married (though I'm pretty sure at least the latter is legal). It's a long story, but the short version is: she surprised me with a proposal in a bathtub on Valentine's Day, and I surprised her with a wedding on top of a hill. Every year since then, on or around our anniversary, we have climbed that hill (weather permitting and with the exception of 2011, when I simply wasn't able to make the trip. In retrospect, I actually don't know why we didn't at least go to the playground there last year.) I've long said that if there is a better metaphor for marriage (or life) -- climbing the same familiar mountain year after year, interspersed with self-inflicted and/or circumstantial challenges -- I haven't yet found it. Except for our trip whale watching yesterday (2010) -- which turned out to be post-hurricane water watching. Saw a harbor seal, a butterfly, and almost saw the gum I swallowed in 2003.
a surprise wedding license excursion to Portland City Hall. shopping for our wedding attire (separately and in secret). Buying our wedding bands and having them engraved, "double happiness may-july 2002" (that was as much either one of us knew at the time). arranging for our friend Tess to become a Notary Public in order to perform the ceremony. convincing Jamie to go for a hike that day without raising suspicions. hiding our apartment key so our wedding party could break into our apartment and retrieve a garment bag of clothes. a red-herring shopping trip to Freeport (because I "hadn't been able to find anything to wear yet"). a sleepless but not obviously sleepless night for me the night before, nervous I wouldn't pull it off. arranging for a potluck at our apartment the evening of the wedding. 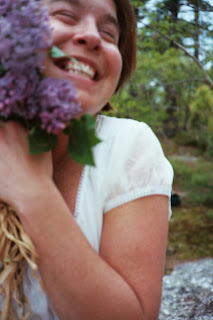 Booking a bed & breakfast in Jackson, New Hampshire, for the weekend following the nuptials (our "mini-moon"). arranging our official honeymoon in in St. John, for June. 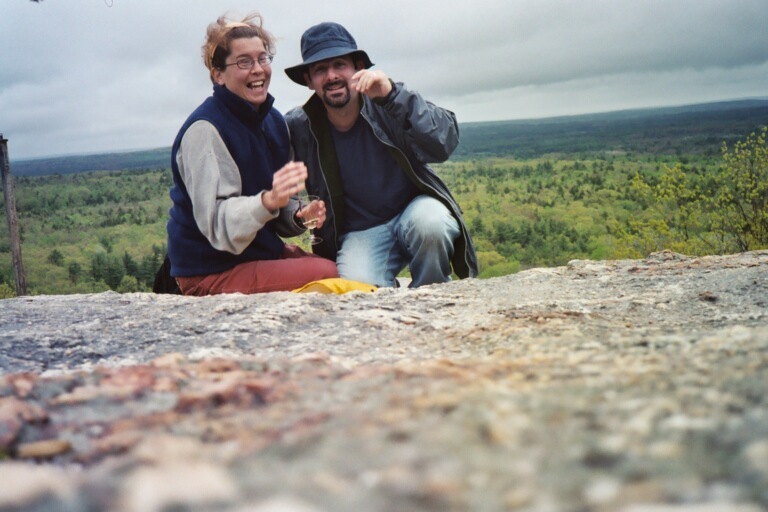 curbing our parents' dissatisfaction with our decision to elope at home by "allowing" them to plan two parties for us in July (one in New Jersey, one in Maine) -- so much for keeping the spotlight off us. 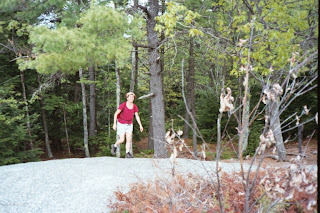 2002: Jamie's anti-consumerism tirade in Freeport and declaration that she, "didn't really feel like hiking!" 2002: a call to the wedding party from the L.L. Bean bathroom had revealed that they (Best Man Jamie Boy, Maid of Honor Kristen, and Officiant Tess) were already waiting for us at the top of the mountain. Any number of years:Wrong trail. 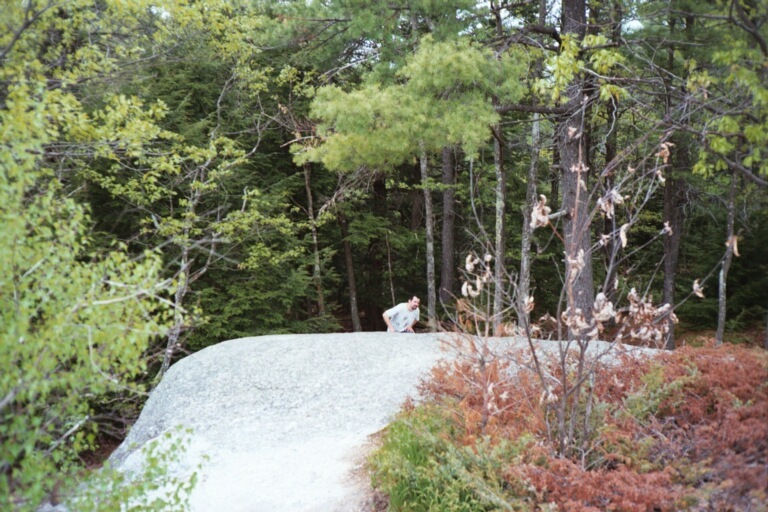 Any number of years: Long trail. Any number of years: Right trail up, wrong trail down. Any number of years: rain mixed with mosquitos. 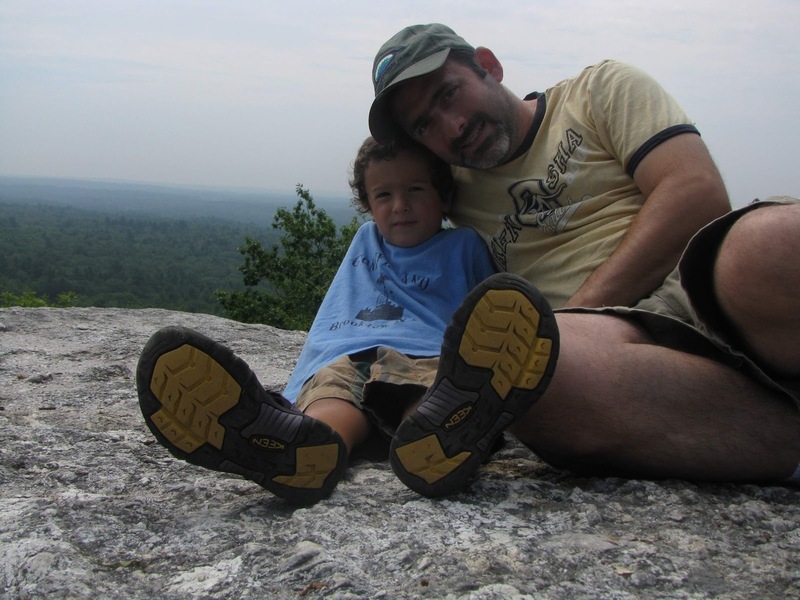 2006: Hauling Wyatt in the backpack (bliss). 2007: Hauling Wyatt in the backpack when he didn't want to (not so blissful). 2007: Carrying a picture of Gus to the top when he was in the NICU. 2008: Coaxing Wyatt to walk up when he didn't want to. 2010: Coaxing Gus (to no avail) and splitting up (Wyatt and I went up, Jamie and Gus went back to the playground). 2011:still recovering from stroke, celebrated at home. Our vows were, not unexpectedly, nontraditional, but I think it's fair to say that over the past 10 years we've certainly had and held each other, definitely for better and worse, for richer (gainful employment!) and poorer (two spans of unemployment on my part, a year of disability payments, living off a single income); in sickness (duh); and in health (of course, taken for granted at the time). In many ways this past year has been both the most enriching and successful of our marriage and the most trying, egregious failure. At least we're coming through it without a constant desire to blame or bludgeon each other (not constant). Ken getting to the top with a grunt of relief. Jamie getting to the top and lying, "I KNEW IT!" Apparently, I still haven't quite learned my lesson, since for this, our 10th anniversary, I tried to meet Jamie Boy, Tess, and Kristen for a picnic in the park, and prepare this blog entry as a gift and expression of love, respect, and admiration for what has been the most important relationship of my life. 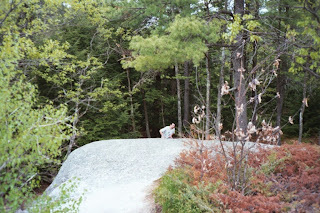 I also hoped to hike as much of the mountain as possible. Unfortunately, only Tess was available, but at least we did hit some of the trail. And I uploaded the pictures without Jamie seeing. Maybe next year I'll climb the damn thing for real, as hard as it is to think that far ahead. Who knows what lies between now and then? It's all an adventure, right?